What Is DA Form 285-A? DA Form 285-A, Technical Report of U.S. Army Ground Accident Index A is a form used for reporting Class A ground accidents in the U.S. Army. The report should be completed and submitted to the U.S. Army Combat Readiness Center (USACRC) within 90 days from the date of the incident. The Department of the Army (DA) released the latest version of the form - sometimes confused with the DD Form 285, Appointment of Military Postal Clerk, Unit Mail Clerk or Mail Orderly - in February 2009 with all previous editions obsolete. An up-to-date DA Form 285-A fillable version is available for digital filing and download below or can be found on the Army Publishing Directorate (APD) website. A Class A accident is an accident in which the resulting total cost of property damage is two billion U.S. dollars or more. Such accidents include the expensive equipment being destroyed, lost or abandoned or any injuries or occupational illness leading to the death or permanent disability of members of command. Each Class A accident requires an accident folder. The DA Form 285-A is a necessary part of every accident folder along with the supporting forms and substantiating data for each copy of the report. How To Fill Out Da Form 285-a? Block 1 is for entering the date the accident took place. Block 2 is a table for detailed data about the accident. An X should be placed in the column opposite each line to indicate whether the related information is enclosed or not applicable. If an X was placed in the "See Remarks" column, an explanation is required in Block 3 of the form. Lines 1 through 12 are listing necessary documentation, and if there are any extra papers submitted with the DA 285-A should be listed in Lines 13 through 18. Block 3 is for the remarks. This item is filed if it's necessary to indicate that any of the required information cannot be provided to the accident investigation board due to a delay or non-availability. Remarks related to delayed information should contain an estimated forwarding date. Remarks related to unavailable information should include reasons for its non-availability. 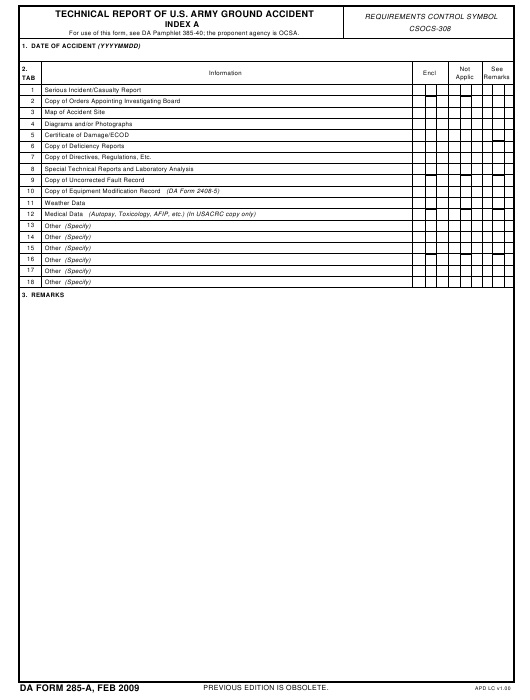 DA Form 285-AB, U.S. Army Abbreviated Ground Accident Report (AGAR) is a three-page form used for reporting C-Class to E-Class ground accidents. DA Form 285-B, Technical Report of U.S. Army Ground Accident Index B is used for making reports of Class B ground accidents. DA Form 285-O, Technical Report of U.S. Army Ground Accident Statement of Reviewing Officials is a form filled out by the officials authorized to record the details of the accident. DA Form 285-W, Technical Report of U.S. Army Ground Accident Summary of Witness Interview is a form used for interviewing a witness of an accident.